Service with Compassion: Two AU Students Named Truman Scholars | American University Washington D.C. 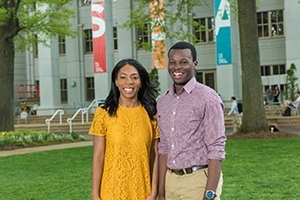 AU students Lexi Ivers (left) and Shyheim Snead (right) were among the 62 Truman scholars chosen out of 768 students nominated. Every year, the Harry S. Truman Scholarship Foundation honors a select group of students for their leadership, academic achievement, and commitment to public service. American University recently learned that not one, but two, of its students earned this distinction. Lexi Ivers and Shyheim Snead, both juniors in AU’s School of Public Affairs, are 2017 Truman scholars. As the student awards are designated by state, Ivers is representing her home of Delaware and Snead was selected for his native Connecticut. Each Truman scholar receives up to $30,000 to use towards graduate study. The students will partake in a week of activities at the Truman presidential library in Independence, Mo., and they’ll also have access to career and graduate school counseling. Next year, they’ll get a summer-long internship opportunity in Washington, D.C.
Warrick effusively praises both Ivers and Snead. “Compassion is a trait they have in common, and a commitment to something beyond themselves,” she says. When Lexi Ivers got the call about her scholarship, she was in the Ward Circle Building. Elated over the call, she told one of her mentors, associate dean and professor Saul Newman. He hugged her, and Ivers then shared the great news with SPA Senior Associate Dean Vicky Wilkins and SPA Dean Barbara Romzek. “The whole SPA office was so supportive. It was great to be there when I found out,” she recalls. It was an apropos way to celebrate her achievement, as Ivers knows the value of people who care. It all starts with her family. That question—“What if I had stayed in foster care?”—would stick with Ivers throughout her life. And she is now devoting her energy to ensuring that other children find caring families. During her Philadelphia high school years—her family has since relocated to Wilmington, Delaware—she worked with at-risk children in foster care. While at AU, she started her own organization, Junior Youth Action, D.C., that provides mentorship, professional development, and mental health services for local foster care kids. “Having stable, loving parents—that’s a privilege, and not everyone has it. Unfortunately, some children were born into really terrible circumstances, and that can set the trajectory for their life. So we try to combat that, and we try to provide a family structure,” she explains. She’s enlisted other AU students as Junior Youth Action mentors. Since foster children are sadly accustomed to disappointment, Ivers scrupulously chooses mentors who are fully committed to the job. Ivers is a law and society major with a public administration and policy minor. With her scholarship money, she’s hoping to attend to Harvard Law School—which has a child welfare clinic—and use the law to assist foster children. Again, this decision is partly drawn from personal experience. “Adoption law literally transplanted me from poverty to a really incredible family,” she says. In her current academic pursuits, she’s working with Douglas Klusmeyer on an independent study on the legal history of the slave trade. Even as she’s currently mentoring young minds, she’s grateful for the tutelage of professors such as Klusmeyer and Newman. Prior to this announcement, Shyheim Snead already had some impressive achievements at AU. He’s in the prestigious Frederick Douglass Distinguished Scholars program. As student trustee, he introduced incoming AU President Sylvia Mathews Burwell to the AU community in January. Snead grew up in Bridgeport, Conn. The area has been beset by economic distress, crime, and struggling schools, he notes. “Statistically, I’m not supposed to be sitting here,” he says about discussing his Truman scholarship. Yet his mother and grandmother stressed the importance of education, and he received guidance from teachers along the way. “I think it was the combination of my faith and my family that really propelled me here,” he says. Snead arrived on the AU campus in 2014, which turned out to be fortuitous timing. The D.C. mayoral race was underway, and he was inspired by candidate Muriel Bowser’s inclusive message. He volunteered on her campaign, worked on her transition team, and later joined the Mayor’s Office of Community Relations and Services. He also feels indebted to his fellow students in FDDS. “That program has provided me with the space to bounce ideas off of people, and be challenged, and to challenge myself,” he says. Snead is a political science major, with a minor in education studies. In a transformative experience, he led an Alternative Break in New Orleans—specifically looking at access to education in a post-Hurricane Katrina environment. Through that passion for education, he’s grappling with how life outside the classroom can influence student achievement. After graduation, he plans to earn his master’s in public policy, with an interdisciplinary focus on urban communities. Long term, he’s considering nonprofit work on poverty and educational access issues. And while hoping to help other cities, he’d like to return to Bridgeport.